Monday night consisted of one of the biggest tests for the New York Rangers as they finished up their road trip in Florida against the best-in-the-league Tampa Bay Lightning. Although the Rangers dropped the game, moving to 14-13-3 and still four points out of the playoffs, this game was a step in the right direction for the Blueshirts and came with more positives than negatives. Following a tough start to the season, Rangers fans should be very excited for the way this team is continuing to develop. From the first drop of the puck, the Rangers were zipping all over the ice: pressing hard in the offensive zone, using the body and finishing checks, and throwing all pucks to the net, creating tons of scoring chances. When the first whistle finally came, I couldn’t believe the level of play the Rangers were bringing, and how much it went on to influence the first half of the game. What stuck out even more was how much Tampa Bay wasn’t playing its game. I quickly realized the Bolts weren’t playing poorly, but that the Rangers’ style of play was preventing them from finding their rhythm, the same rhythm that has earned them the top spot in the league thus far. This was the most promising period and a half of play I’ve seen from the Rangers since their 9-1-1 streak a few weeks ago, and should have Rangers’ fans jumping. When the Rangers are playing like this, with the young guns contributing just as much as the veterans, the team is on a different level. Not many teams have had success with knocking the Lightning off their rocker, but the Rangers were leading by a goal after the first period, and seemed to have control of the game throughout most of the first 20 minutes of play. When this team is clicking, they can be great, and as these rookies continue to develop with this type of disrupting tempo, the future of the Rangers points to nothing but success. At the end of 60 minutes, however, the story was nowhere near the same, with the Rangers falling 6-3 (with one of the Lightning’s goals being an empty-netter). The problem? Consistency. While the Rangers came out on fire, they took penalty after penalty, which completely upended the momentum and tempo they had coming from the first period. Steven Stamkos found his sweet spot on the power play and finished the night with his ninth career hat trick. That was that. But it isn’t all negative. Looking back on the game, the Rangers can see that it wasn’t lack of effort nor lack of skill that cost them the game. Rather, allowing a team that is second in the league on the power play (29.2 percent) to have multiple man-advantages does not put your team in a position to win, and changes the style of play from aggressive and hard-nosed to defensive and timid. Besides the penalties, the Rangers played a good hockey game, with the other problems occurring from spotty play. The Rangers need to continue to focus on playing a full 60 minutes, not just parts of each period. With David Quinn as head coach, this shouldn’t be a problem. Quinn repeatedly talks about playing a full game, working for your ice time, and competing on both ends of the ice. This is also something that develops with time in this league, as younger players adjust to the long season, quickened pace, and raised intensity. 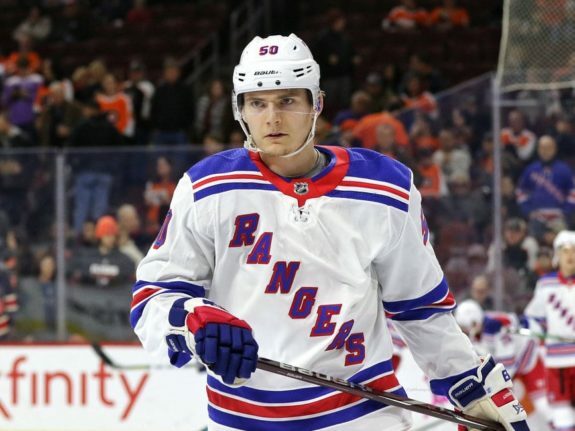 However, if what the Rangers showed in the first 30 minutes of play is any indication of how this team can perform with all systems running, then the development the Rangers’ management hoped to see this season is unfolding nicely. The start of any great hockey team is never an overnight project. It takes years to reach full potential, with peaks of greatness occasionally being noticed as the pieces come together. The Rangers’ start against the Lightning on Monday is exactly that: a preview of how good this team can and will be in the near future. Rangers fans, stick it through these few rough years, because the team that is emerging on the other side is the most promising in half a decade.